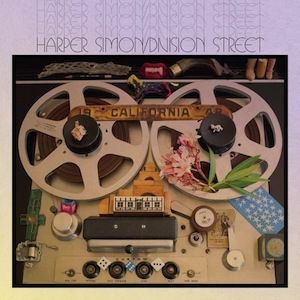 If Harper Simon’s debut album was Neil Young, its follow-up Division Street is definitely Crazy Horse. Paul Simon’s eldest, who recently launched his solo career, has culled an impressive roster of musicians to play on this fuzzed-out sophomore LP. Problem is, it tends to be the wrong type of fuzz. Blame the engineer, but the overbearing compression on the mix must be mentioned. It stifles the album’s muscle and makes otherwise fun tunes like “Dixie Cleopatra” nearly unlistenable. “Radio Radio” organ over for “Eternal Questions.” Simon has created a musically varied record, with well-written acoustic tracks and Victorian chants all making appearances. However, a wealth of juxtapositions means Division Street has a hard time deciding what kind of album it wants to be. Space-rock? Quirky throwback pop? Punk? It’s all there, just unsorted. “You can be who you wanna be” (from “Veterans Parade”) is a mantra Simon takes to heart.